Brief: This quick tutorial shows you how to go back to Xorg from Wayland in Ubuntu 17.10 and vice versa. One of the main new features in Ubuntu 17.10 is the addition of Wayland as the default display server. As more and more Linux distributions are moving away from the legacy X.Org server and Wayland seems to be the top alternative. While Wayland maybe the future, it really is in future. At least for Ubuntu 17.10. The issue here is that a number of Linux desktop applications still depend on X.Org. They don’t support Wayland very well. For example, I had a hard time trying to record screen in Ubuntu 17.10. Apart from Green Recorder, none of the other Linux screen recorders worked. This spoils the otherwise pleasant Ubuntu 17.10 experience. So what would be the solution here? Wait for all those applications to work with Wayland? An easier way out would be to switch back to Xorg from Wayland. And I am going to show you how to do that in this quick tip. Remember that I said Wayland is the default display server in Ubuntu 17.10. It also means that there are more than one display servers available. And we can simply switch between them. No need to install anything new. In Ubuntu 17.10, restart your system. At the login screen, under the password field, you’ll see a gear icon. Just click on it and you’ll see two options here. 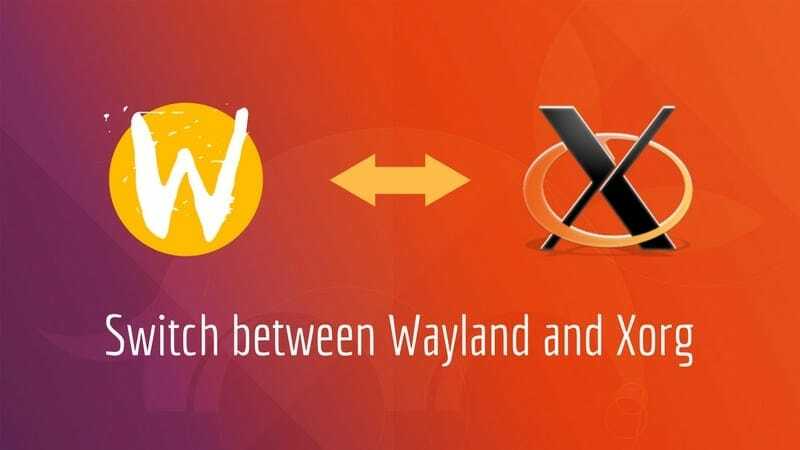 The default Ubuntu means it will be using Wayland while Ubuntu on Xorg obviously means it will use Xorg. You can select Ubuntu on Xorg to use Xorg here. Similarly, you can switch back to Wayland when you feel like it. And then if you see X11, it’s Xorg. If you see Wayland, quite obviously, the display server in use is Wayland. Quick Tip: Few programs that require root privileges have troubles with Wayland. For example, gParted won’t run at all in Ubuntu 17.10 if you are using Wayland. If you don’t want to switch to Xorg, there is still a way to use these applications with sudo. This tip was suggested by It’s FOSS reader Sean and was found here. I hope this quick tip helped you to switch to Xorg from Wayland in Ubuntu 17.10. Stay tuned for more Ubuntu 17.10 tips and tricks. I am able to login only using wayland. If I choose xorg (ubuntu) option on the settings icon, it doesn’t say wrong pass but it won’t let me login. The same login credentials work fine with wayland option. I see no “Wayland” options. I normally use Ubuntu on Xorg (XDG_SESSION_TYPE –> x11), and it appears to be a fully functional Gnome desktop with Ubuntu dock (bottom), etc. I tried Gnome on Xorg and had a major crash when using the screencast utility (no dock, but Favorites appear on left when Activities is active). The following Google search – “Ubuntu on Xorg vs Gnome on Xorg” – yielded only discussions on Xorg vs Wayland (including this page near the top). Can you please comment on the difference between Ubuntu on Xorg vs Gnome on Xorg?